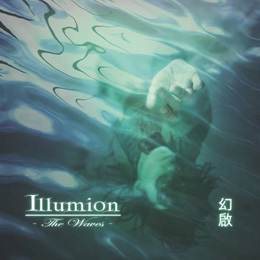 On first glance Illumion could be shoved off in the clichee corner: Dutch, female vocals, keyboard rock to metal. Nevertheless the group choses on the second album, produced by bassplayer Peter, a wider road, without derailing. They have invested less in cliche hits then in a mixture of prog. with metal-elements in feel. Following this the musicians need their time before they've said all they need within one piece, this also applies to the enchanting Esther Ladiges, whose lyrics are not mere shiny additionals. "Ember", with almost ten minutes an uncommon opener choice, is mainly intended for her, until the men enter with the choir. Apart from the dancefloor synthesizer and single shouts the whole thing is played out satisfactory and driven to a dramatic climax. Chorus? No way. Adequatly they continue with the graspable "Adamantine", which is based on a conventional eights-Rythm, but paint many soundcolours, some atmospherical noise and plucked acoustic guitars that towards the end show a jazzy Flamenco ride. The riffer "The Craft Of Memory" proves, with its imprinting marimba sounds, to be almost a genre hit, and contains, like the ballad "Sorrows End", a normal rock structure. In "A Tale Of Kings" these lose ground again in favour of soundsplay, especially by organplayer Leijdekker, while van Kampen, like somewhere else, plays viola. What finally speaks for this group is less their commercial variation on Progressive metal, but more their coquetry with diverse moods, that come from the story-telling character of the songs, because the music plays second fiddle to the lyrics. In some question-answer parts and especially during "Espirando" the singer can compete in expression with the type Tori Amos or Kate Bush. "Mystify" (guitarsolo highlight) mixes the young ARENA with THE GATHERING and towers above the following "Canvas". This piece is with fretless bass and mandoline really minimalistic and the vocal melody won't leave your head. A unity is built with the final "The Waves", with also a not unexiting duett between both ladies. Bottom line: ILLUMION does not unlock itself without effort, but the time spent with their music does pay off, as long as you have a weakness for tulipprog like GANDILLION. Apart from that MOSTLY AUTUMN without the sugarcoating, MAGENTA or STREAM OF PASSION come to mind.